William Malucu was born in Pilar, Alagoas, 1975. He is a contemporary painter, working and living in the popular coastal town of Fortaleza, Brazil. The nightlife, the view on the Atlantic ocean, combined with the inspiring classical music of Mahler and Bach playing in the background form the ideal working conditions for Malucu. 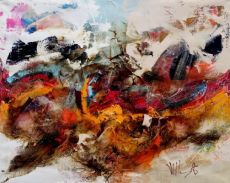 In his own zone of concentration, he achieves to translate his... Read moreWilliam Malucu was born in Pilar, Alagoas, 1975. He is a contemporary painter, working and living in the popular coastal town of Fortaleza, Brazil. The nightlife, the view on the Atlantic ocean, combined with the inspiring classical music of Mahler and Bach playing in the background form the ideal working conditions for Malucu. 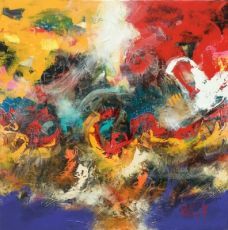 In his own zone of concentration, he achieves to translate his colourful experience of the world onto canvas into communicating depictions. Because he uses brushes as well as his own hands in this, he surprises us with purity each and every time. Constantly searching for new perspectives and substances, he works with a range of materials from gold leaf to old newspapers.